“Palisades” reflects a sunrise in Squaw Valley. As I walked into Coffeebar in The Village at Squaw, I noticed triangular, painted wooden and clay pieces on the walls that seemed to give a subliminal, peaceful feeling and connection to nature. 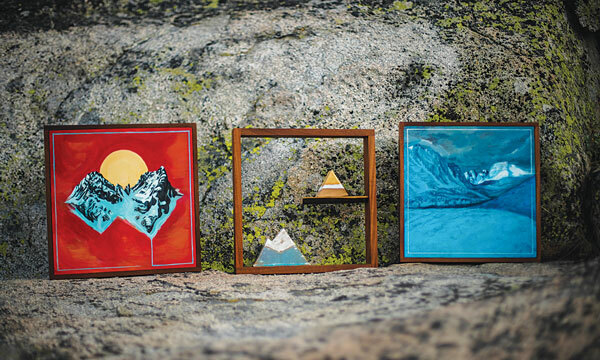 The simplistic, geometric shapes with painted mountainscapes on them perfectly complemented the expansive mountains outside. I met the artist of these wall hangings, Chelsea Jolly, in Truckee at a different coffee shop; an affinity for chai teas are just one of the things we have in common. In fact, I feel like I’ve known her for years. She’s outdoorsy, inspiring and she makes her art look effortless, even though I know that what she creates takes a lot of time, patience and commitment. 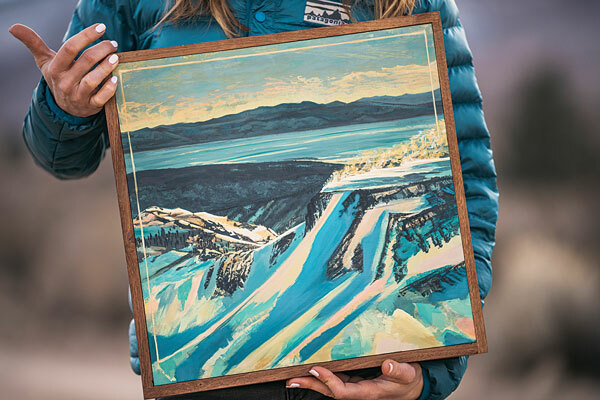 Originally from Bend, Ore., she developed a love of the mountains and the outdoors at a young age simultaneously with painting and making things. Seven years ago, Jolly moved to Tahoe for the ski season, but returned to Portland State University to earn her degree in Spanish and applied linguistics. Then Jolly got into nutrition and started a successful snack-food company, which grew rapidly. Out of all the aspects of her business, Jolly enjoyed the creative design the most and moving back to Tahoe was never far from her mind. “I always thought about getting back to the mountains and I’ve always been into art. I started out as an art major and moved to Florence, Italy, but art was all about copying the greats. 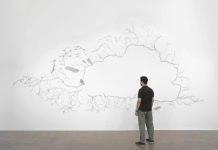 That helps with learning a foundation, but there wasn’t a lot of contemporary art around,” Jolly says. “Peakscape,” a mix of glazed ceramics and wood. 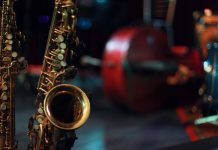 During her time in Italy and studying the art scene, she felt like she was watching a preview to a movie she didn’t want to see. “I decided that I wanted to do something different for a career and keep art sacred,” she says. During her time growing her snack-food company, she recognized her passion for creating designs and started consulting. 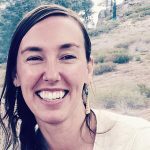 So she moved back to Tahoe and studied graphic communications at Truckee Meadows Community College, falling into a career of film and videography. She had some creative friends in the industry who took her under their wings and mentored her. Through her connections, Jolly landed some filmmaking jobs producing small documentaries and commercial work for Jeep, Harley Davidson, Yeti, North Face and Patagonia. As an avid backpacker and mountaineer, Jolly enjoys travelling the world and getting people stoked on natural environments. She also advocates for female empowerment and enjoys taking jobs that show a female perspective and portray their places in action sports accurately. Always inspired by the mountains, she started making ceramic solid structures in the shapes of peaks to add a multidimensional effect to a landscape. She also makes beautiful wooden furniture, inspired by her dad who was a carpenter, and wooden frames for her canvassed pieces. “I just love making things,” she says. This past spring, Jolly looked at images that one of her friends took of Squaw Valley using a drone on one of the biggest powder days of the 2017-18 season and decided to create an exhibit based on that to display in Coffeebar in the Village at Squaw. 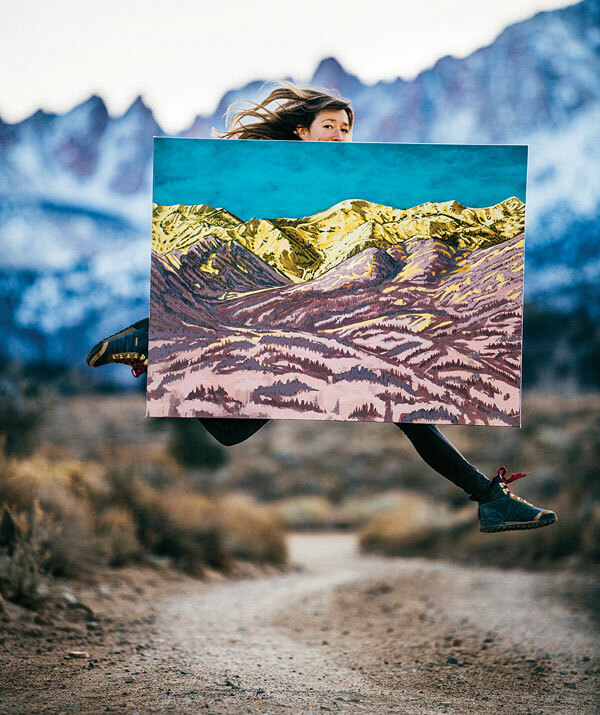 She created six pieces for the show, which mostly involved mountainscapes made in acrylic oil on wood, ceramic and canvas. “Powder Day” reflects one of the biggest snow cycle in Squaw Valley on record during the 2017-18 season. 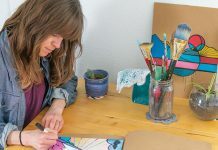 Jolly says she loves using an explosion of color and form, finding the value in it, building from her imagination the things she is passionate about. She also aims to create art with a purpose that promotes change in environmentalism, conservation and preservation. “I’m always asking myself, ‘How can I take my creativity and background in nutrition to make a positive change in the world?’ Film is a direct link to that, but I would love to do more art around activism,” she says. I notice that she is wearing triangular earrings; she admits that there could be some symbolism in the shapes that show up in her art. While her career is in filmmaking, Jolly says she would love to focus on painting full time.